Once again we're off to an early start (7 AM). 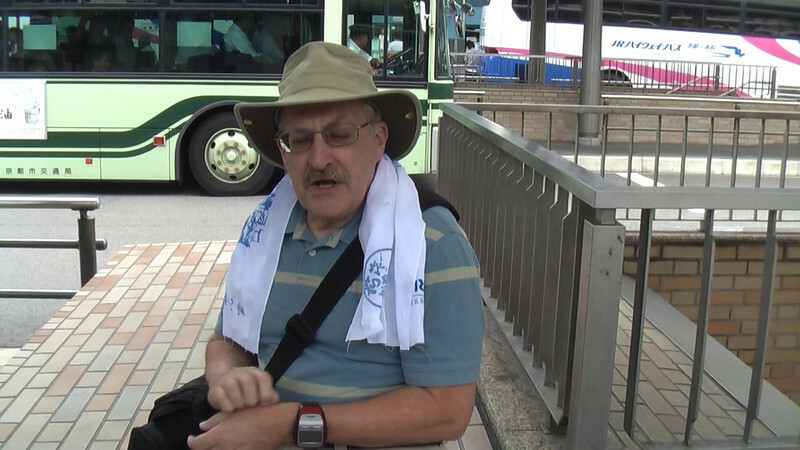 The bus station was on the other side of the train terminal from our hotel, so the day began with more walking. 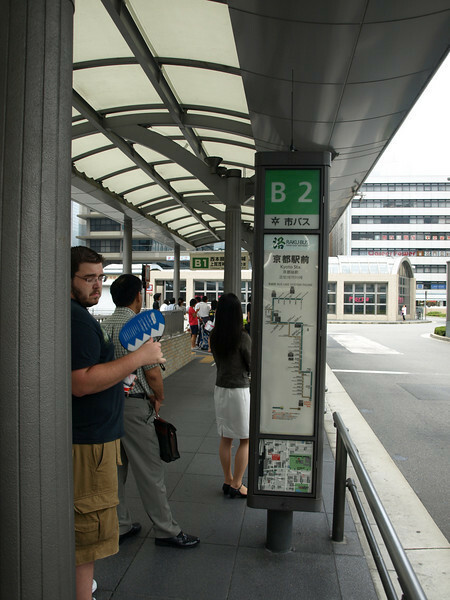 A little help from the terminal attendant got us to the right bus stop. 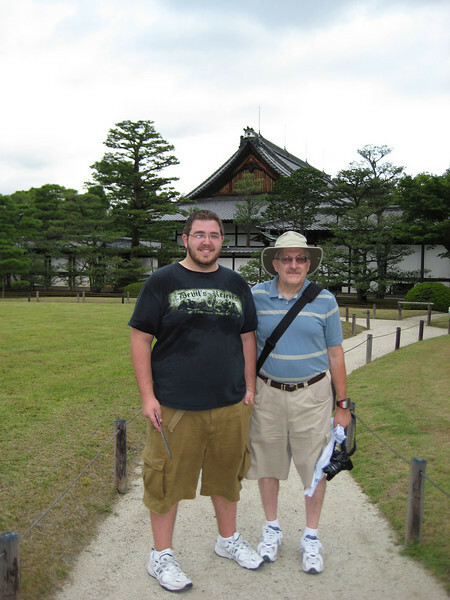 Josh and I had debated which bus to use to get us to our first stop, Nijo Castle. 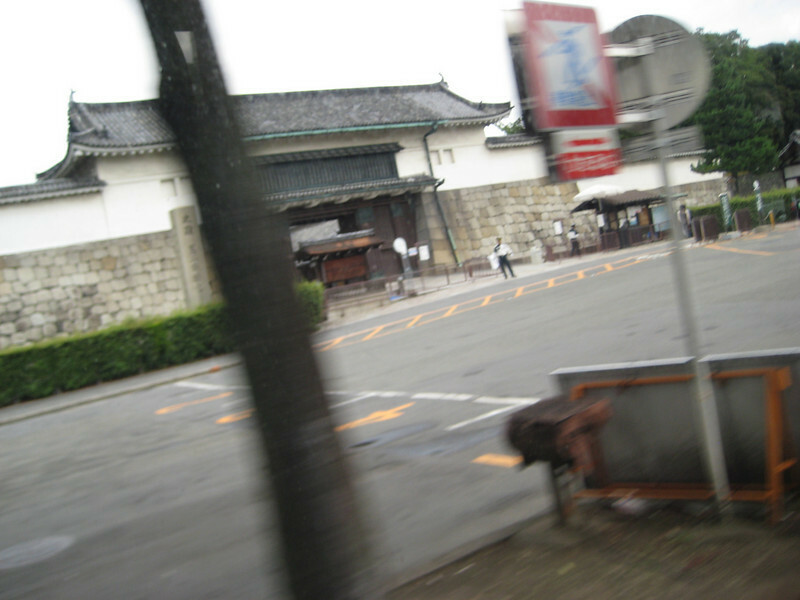 Although it might take a little longer to arrive, I opted for the tourist bus as it would have fewer stops. 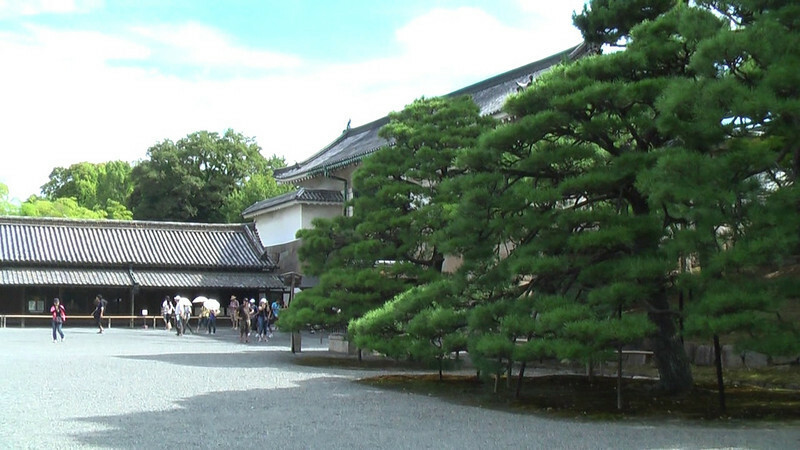 I had spent a great deal of time researching Kyoto transportation, purchasing special maps and more and had not come up with much in the way of a plan to get around. Just by the chance of taking random buses these last two days, I had finally figured it out. 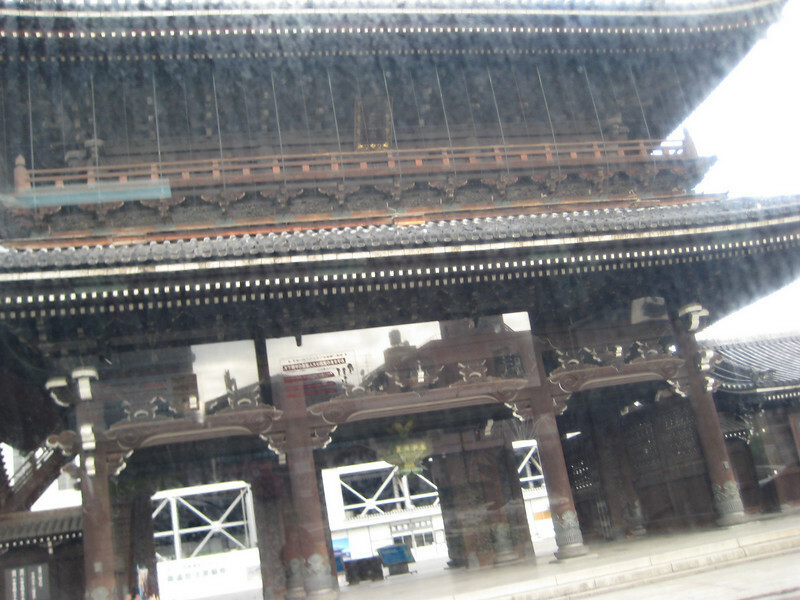 Kyoto has two bus systems, the normal municipal transport system and a special sightseeing transport called Raku Bus that focuses just on the shrines and temples. 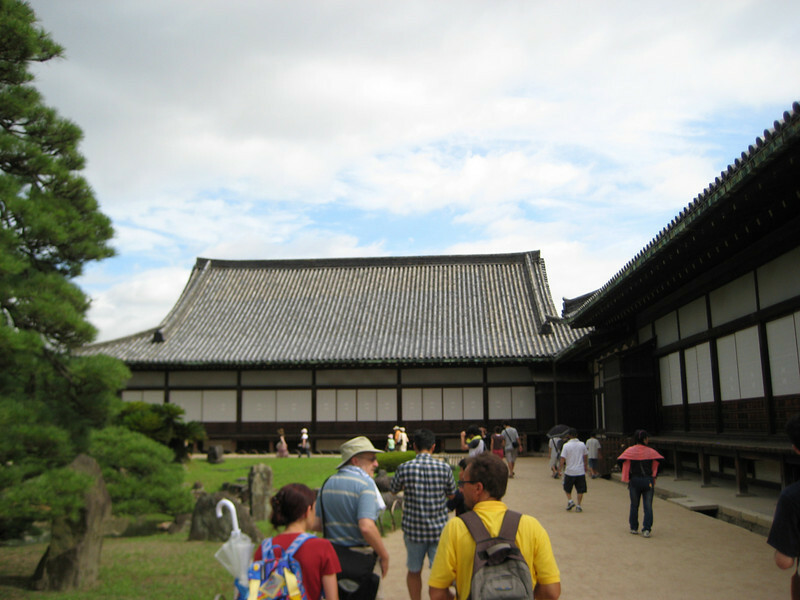 In addition, it has signs and on-board narration in English. 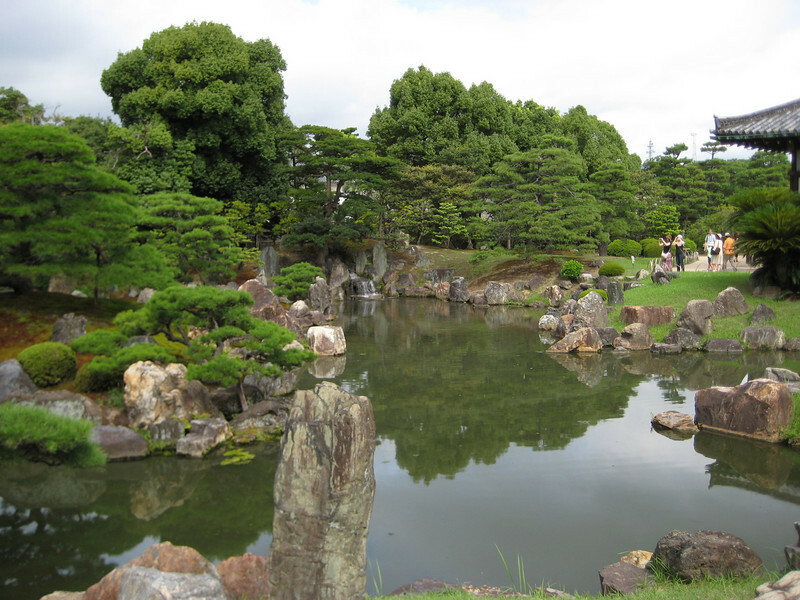 There are three Raku bus routes (100, 101 and 102) that will take you in a big loop to almost every important site in Kyoto. It couldn’t be easier. 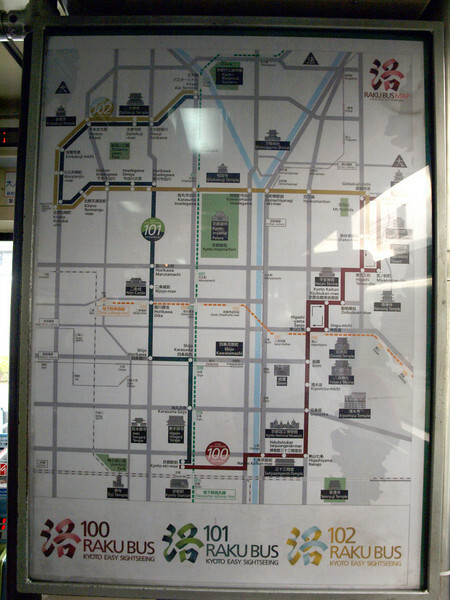 This particular map is on bus 101 as we headed north to Nijo. 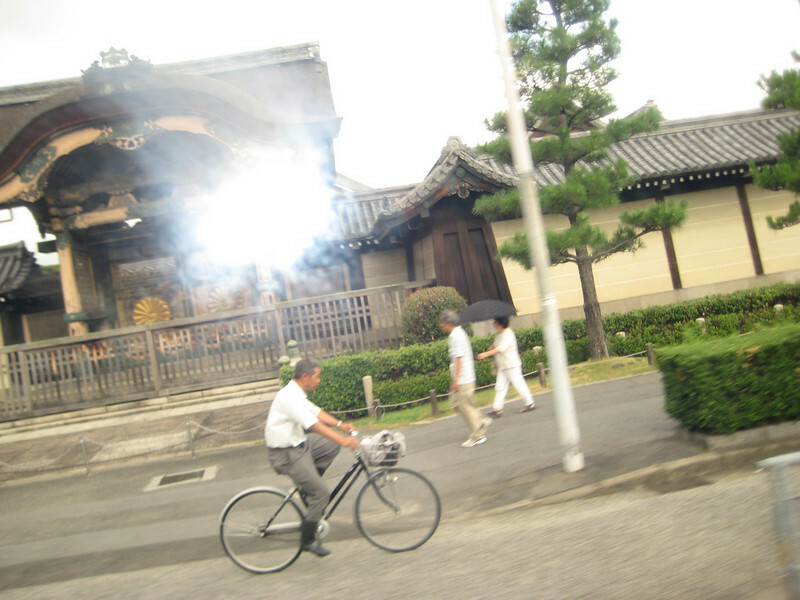 We pass a few temples on our way north up Horikawa Dori street. 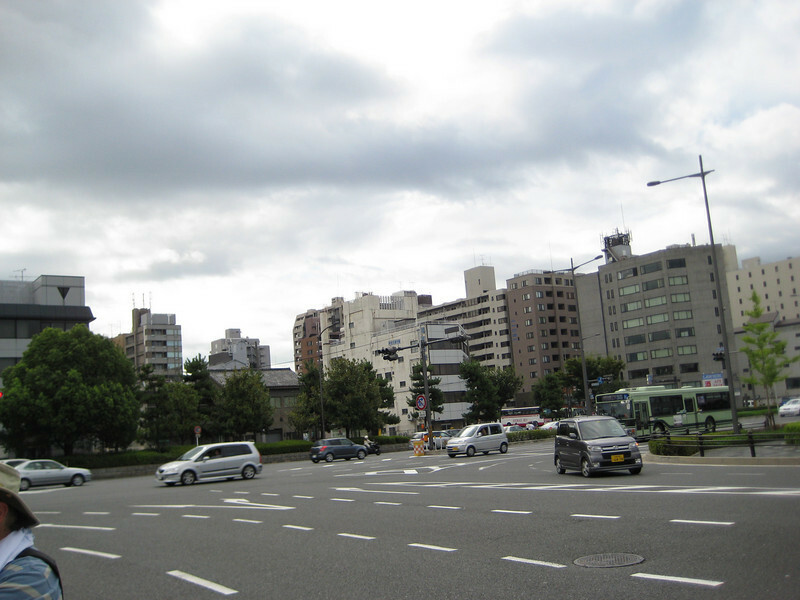 We continue north on Horikawa Dori. By the way, just like with our other photos, these are all geo-tagged, so please make use of the "Map This" button at the top to see the exact geographical location of each of these photos. 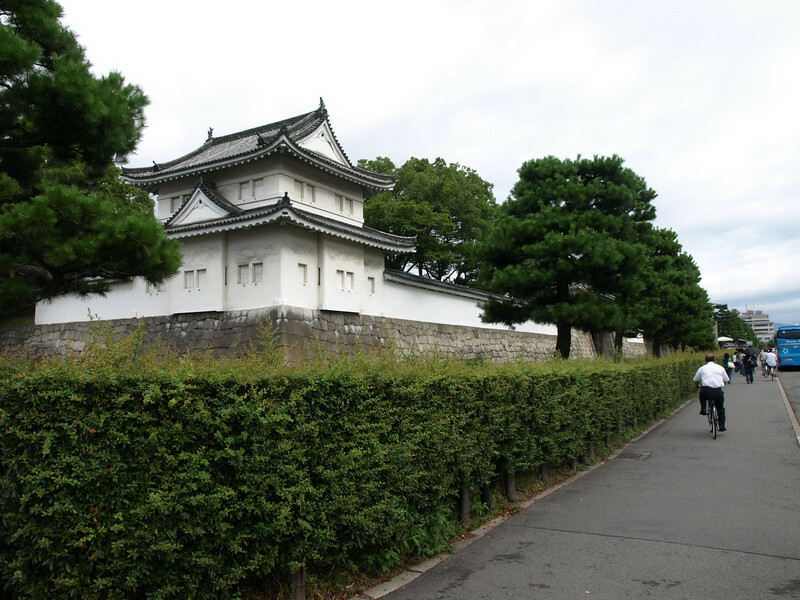 Because we had arrived so early, the castle had not quite opened yet so we spent a little time walking around the outside. 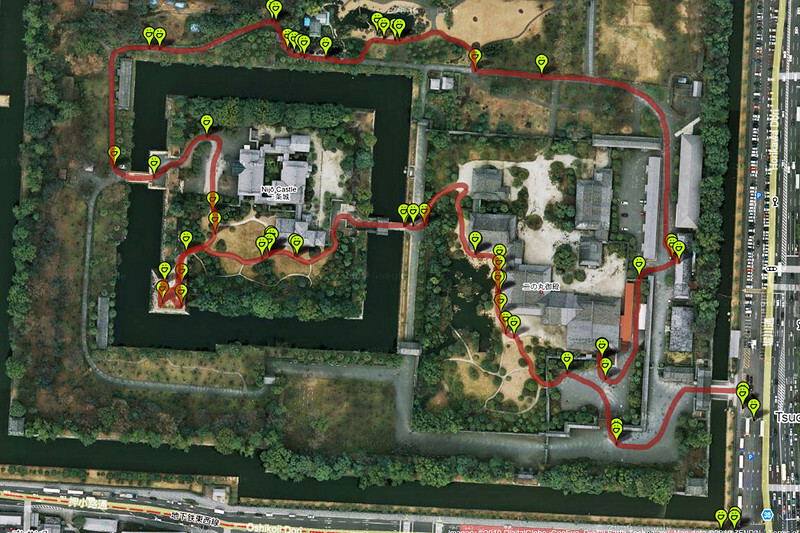 This is an overhead view of Nijo Castle noting our geotagged photos along with the mile long path that we took. 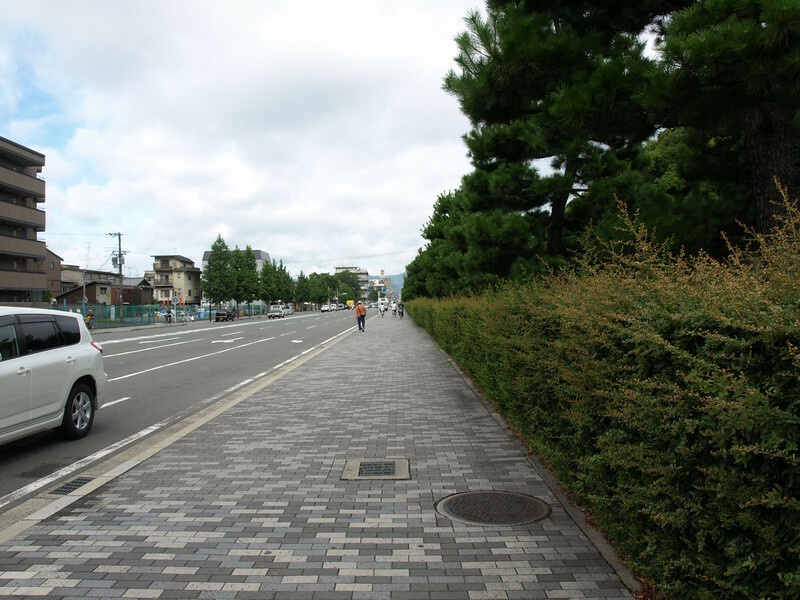 A view of the traffic before making our way back to the entrance. 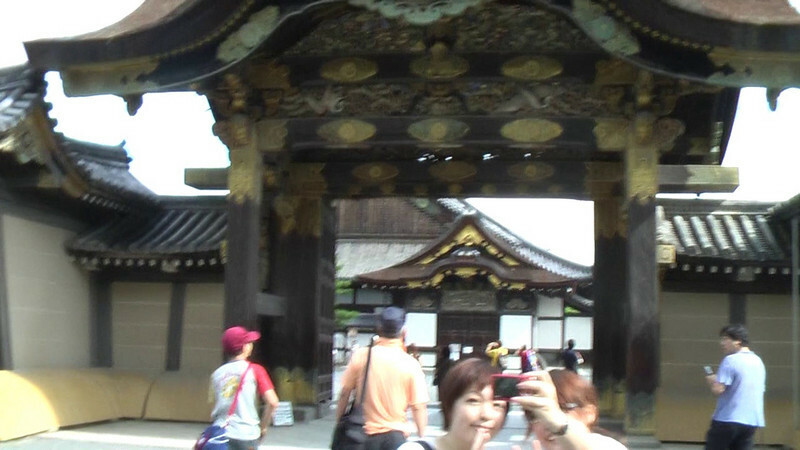 Closer view of the door. OK, I'm ready for them to open! 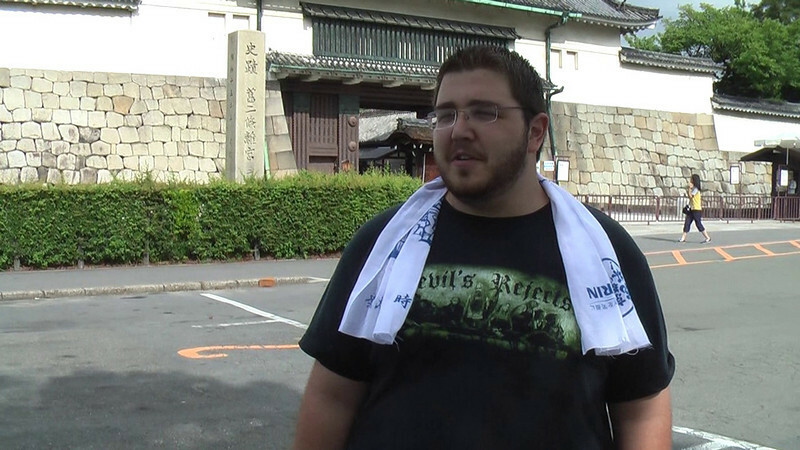 While we wait, Josh makes an interesting observation as to why Nijo Castle couldn’t have been built by the shogun Tokugawa Ieyasu. Who says you can’t learn anything from video games? 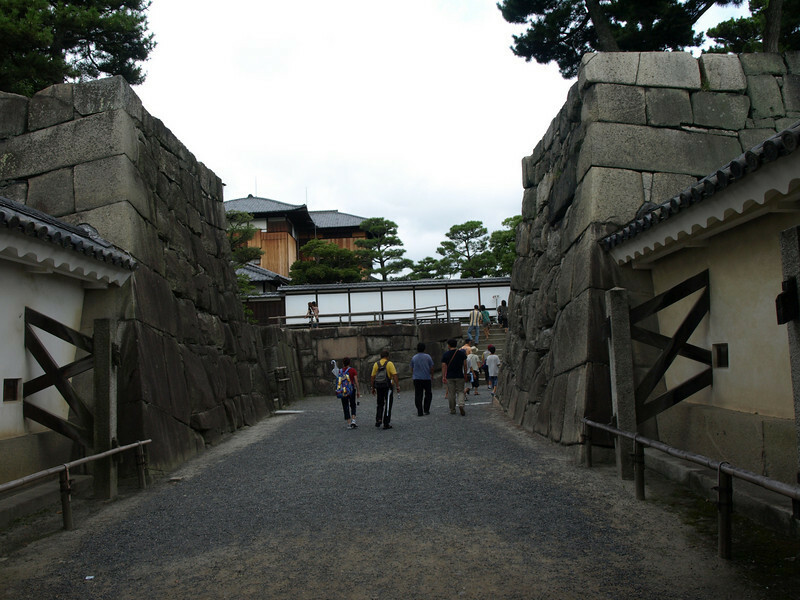 Notice inside the gate where the gravel is being watered down to cut the dust. 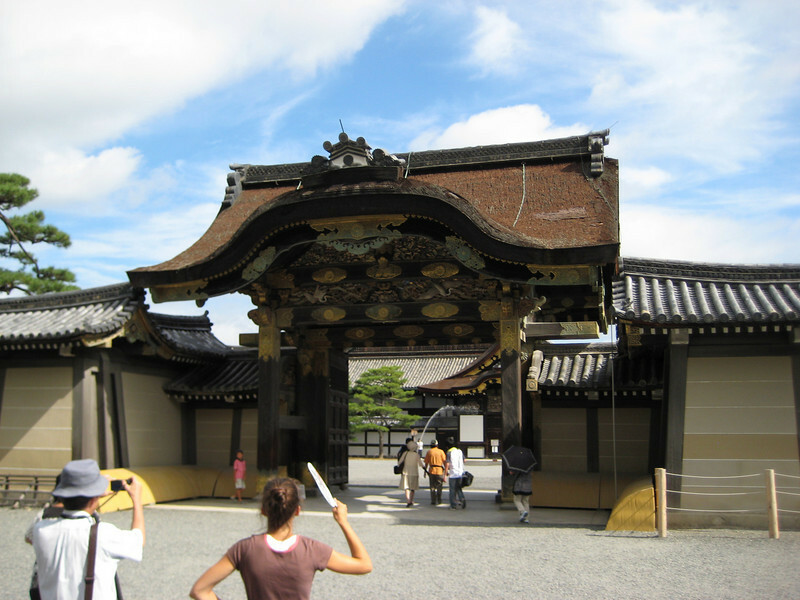 Walking through the Karamon Gate. 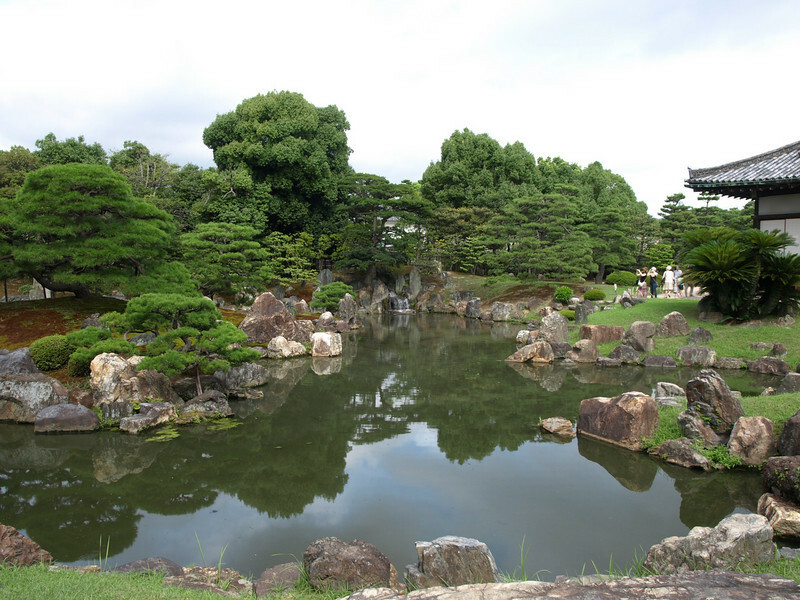 These gardens were designed by the famous landscape architect and tea master, Kobori Enshu. 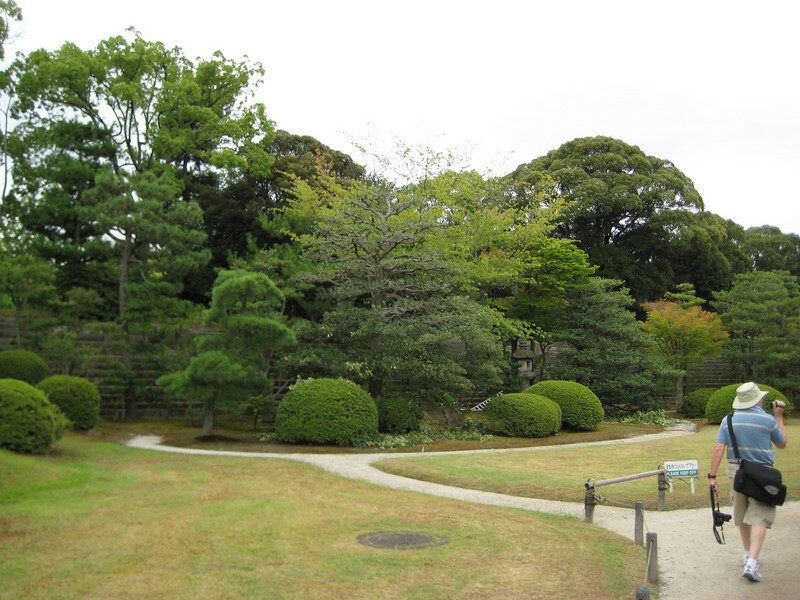 Notice the small stone bridge that allows access to the back section of the garden. 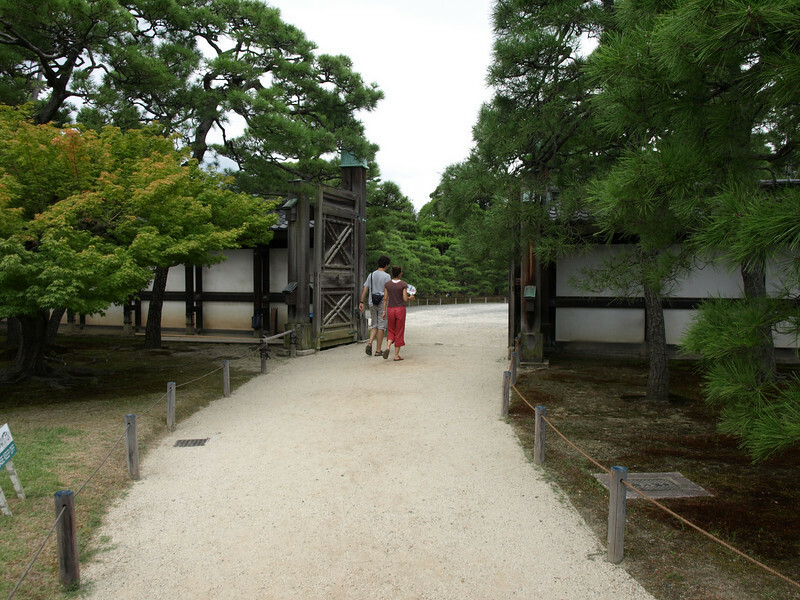 We continue along the walkway that winds between the palace complex and the gardens, both with the name of Ninomaru. 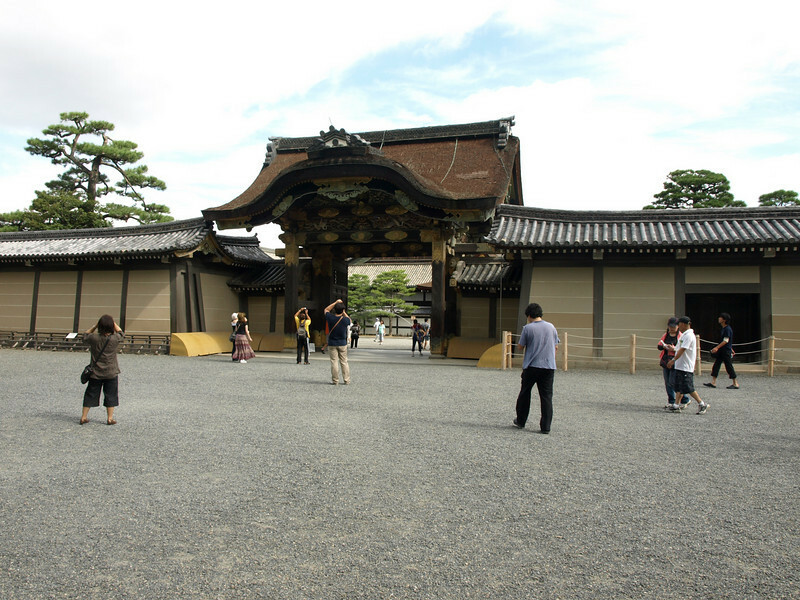 Ahead of us is the Kuro-shoin room of the Ninomaru Palace which was used for the shogun's private meeting quarters. 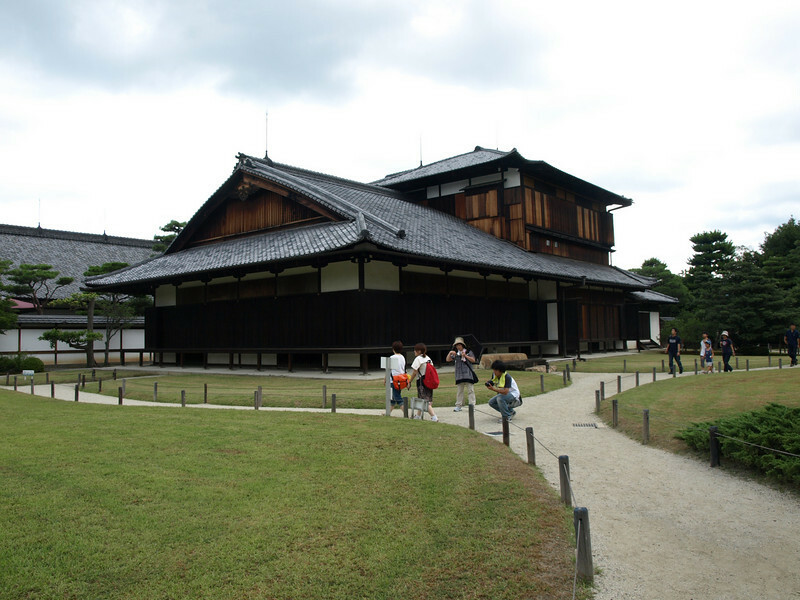 To the right is the Ohiroma room where the shogun would hold public meetings with the feudal lords. 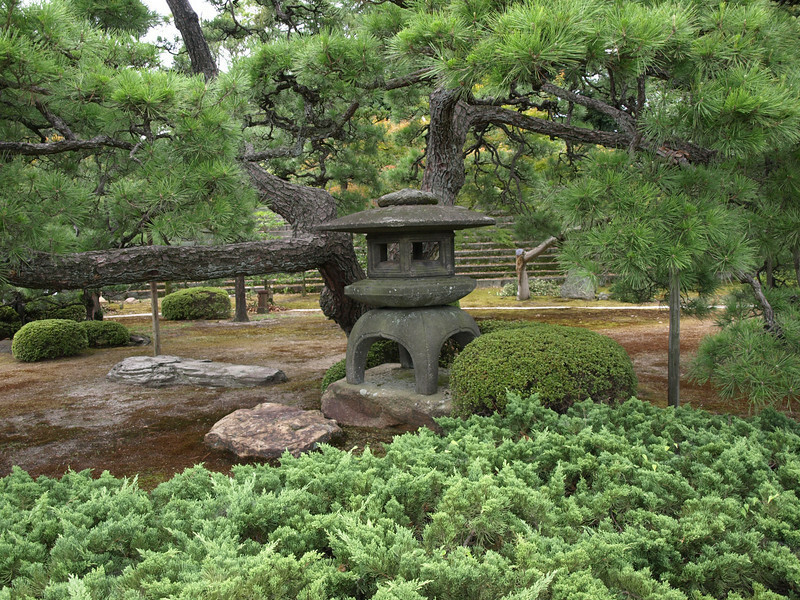 The garden is made up of three carefully placed islands along with many rocks and trees. 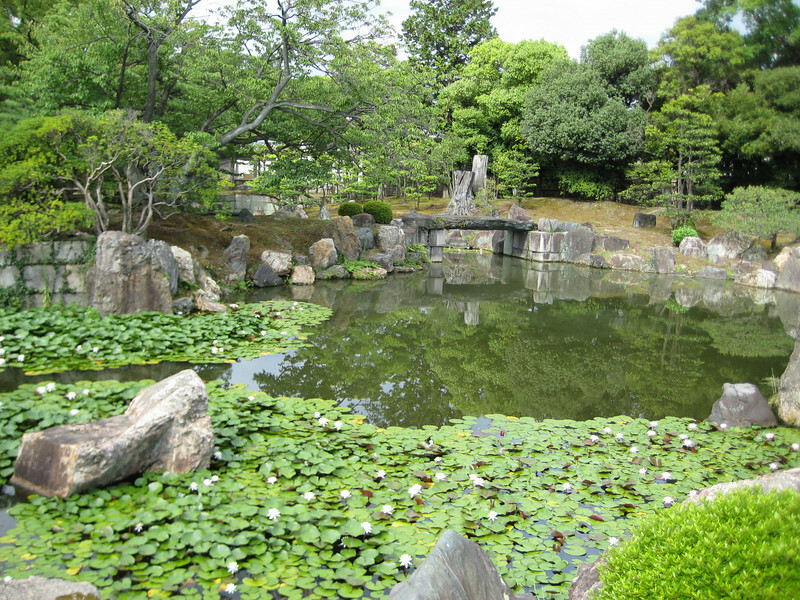 Pictured here is the main island that lies in the center of the pond. 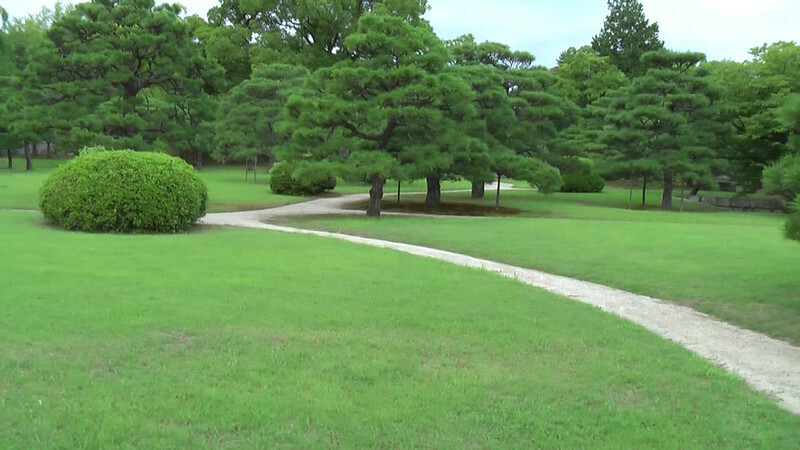 It is called Mt. 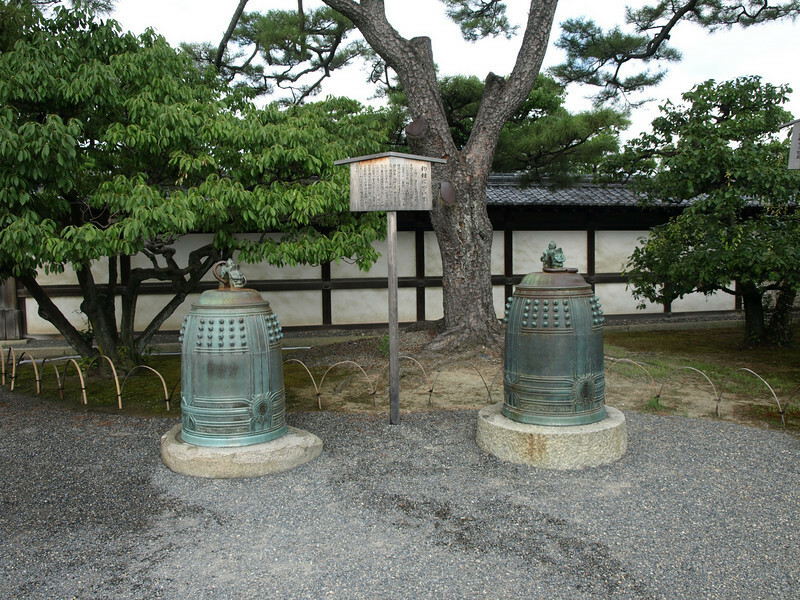 Horai and, according to our guidebook, here once lived a legendary hermit with miraculous powers. Note the two little bridges to the left, one that links the main island, Mt. 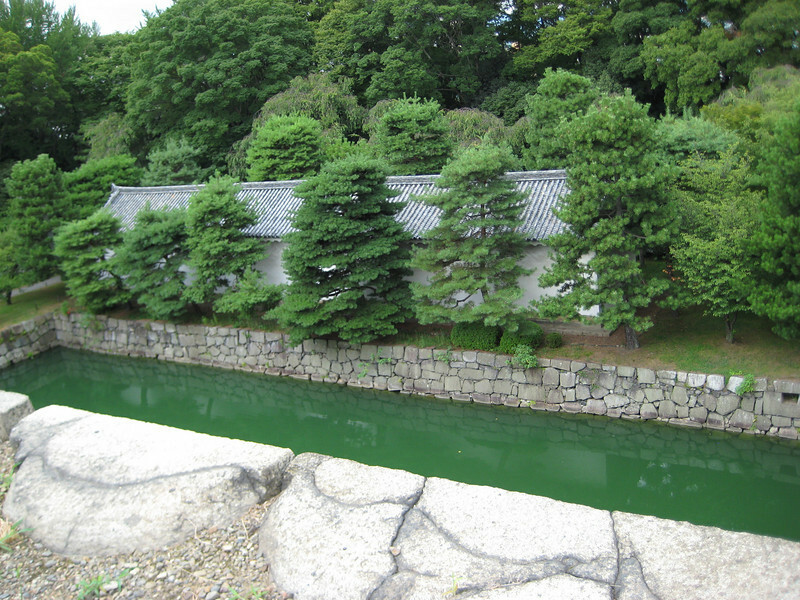 Horai, to the back of the garden and a smaller bridge in front that links Mt. 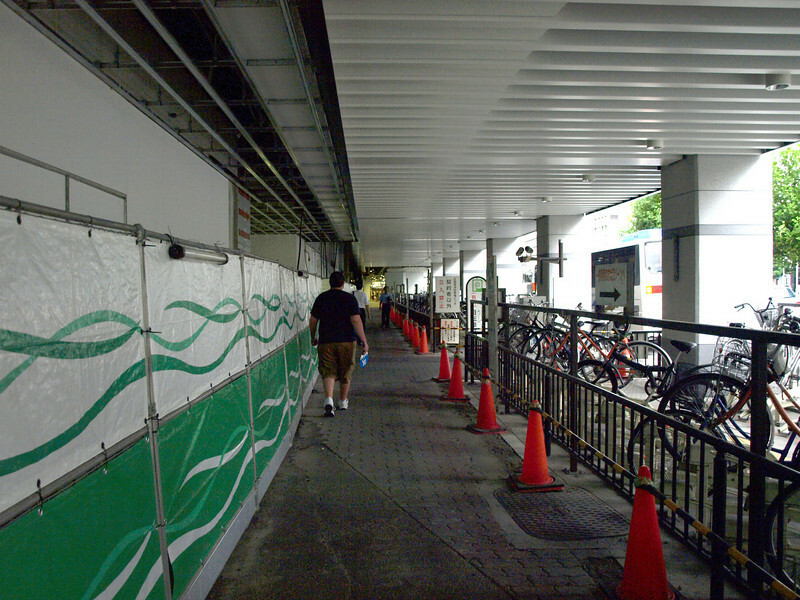 Horai to Crane Island. 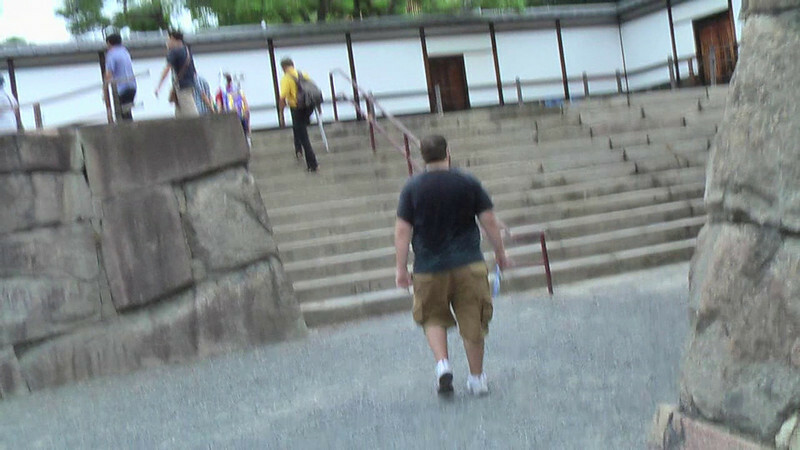 On the other side of Mt. 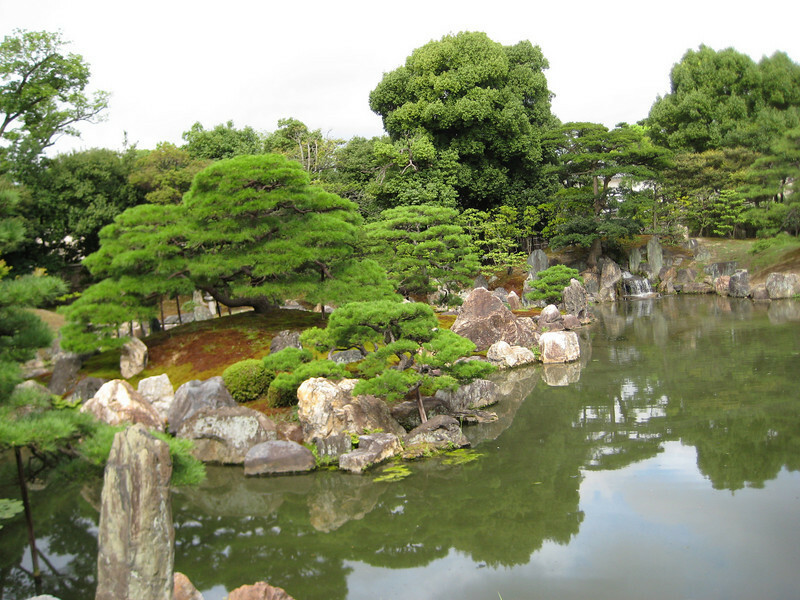 Horai is Turtle Island (not pictured here). 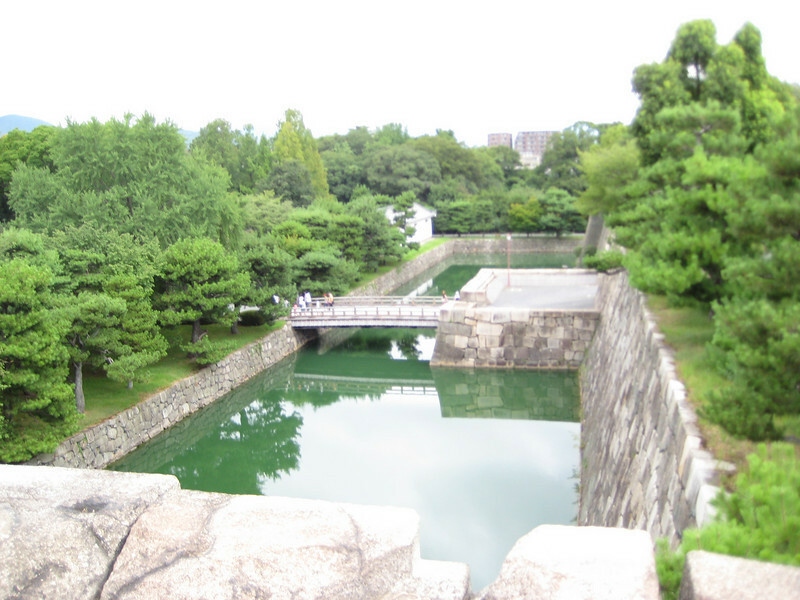 With this video, we take our leave of the gardens and walk through a small gate that leads to the moat surrounding the inner Honmaru Palace. 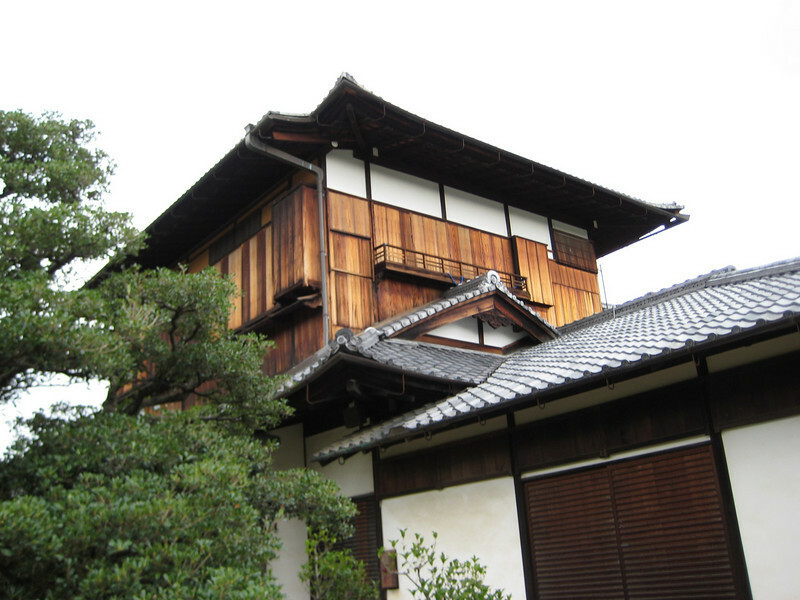 Looking up at the 3 story Otsune Palace, a wing off of the main Honmaru Palace. 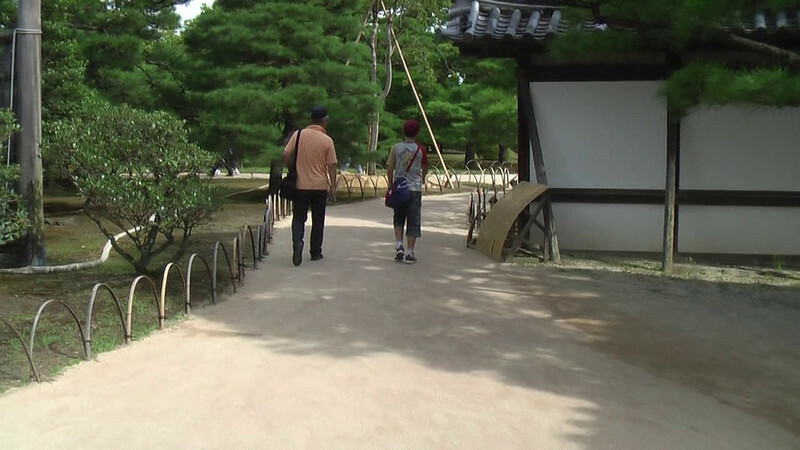 Here we are looking at the Honmaru Palace complex. 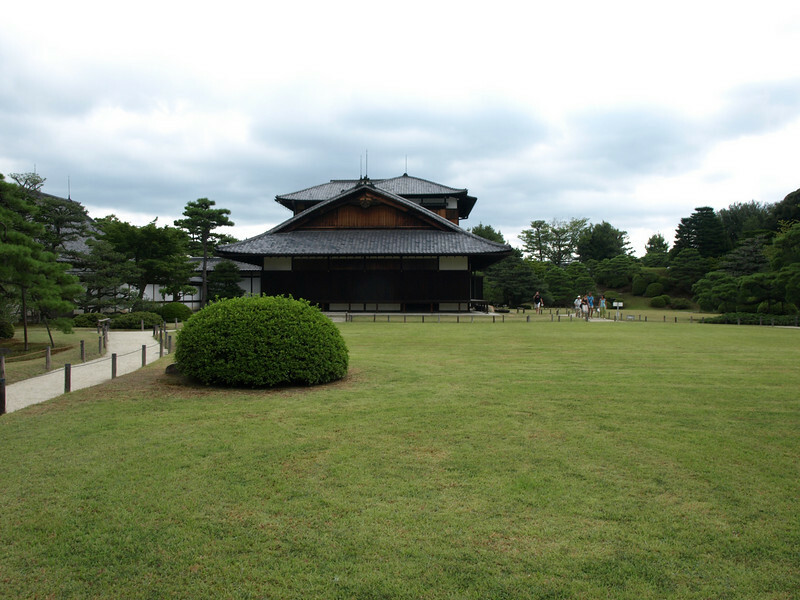 The original Central Keep built here in the early 1600s burned down in the mid-1700s due to lightning. 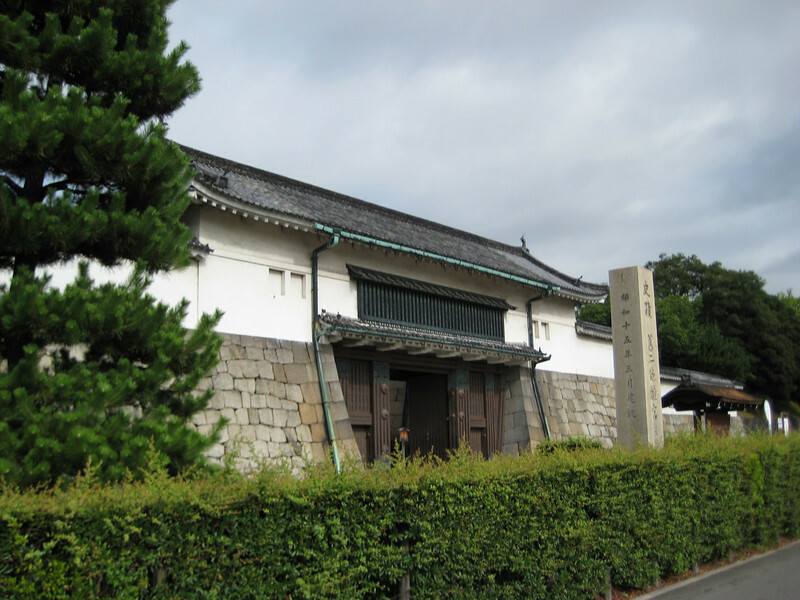 The current structure was formerly the Katsura Imperial Family residence which was moved here from the Kyoto Imperial Palace back in the Meiji Period around 1890. 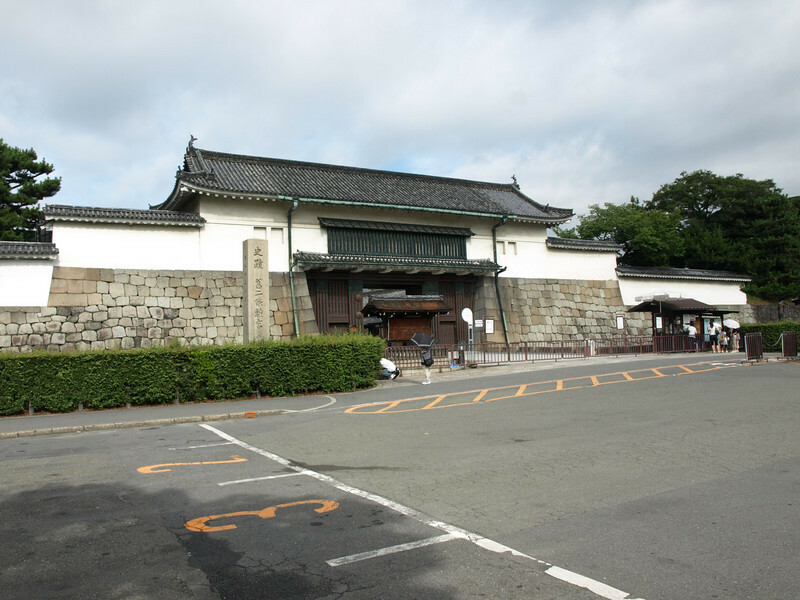 To the right is the Otsune Palace. 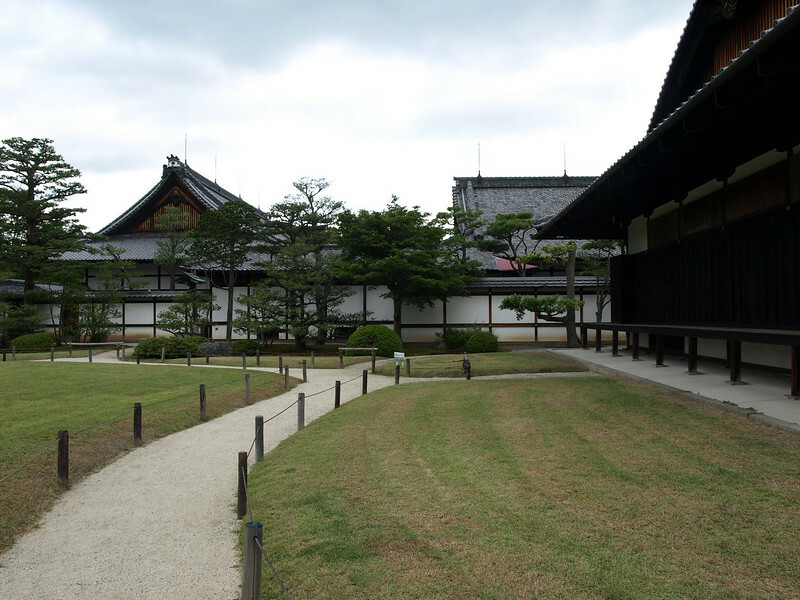 A different view of the Otsune Palace which was home to Emperor Komei's daughter, princess Kazunomiya, the last Lady of the Katsura line of the Imperial family. 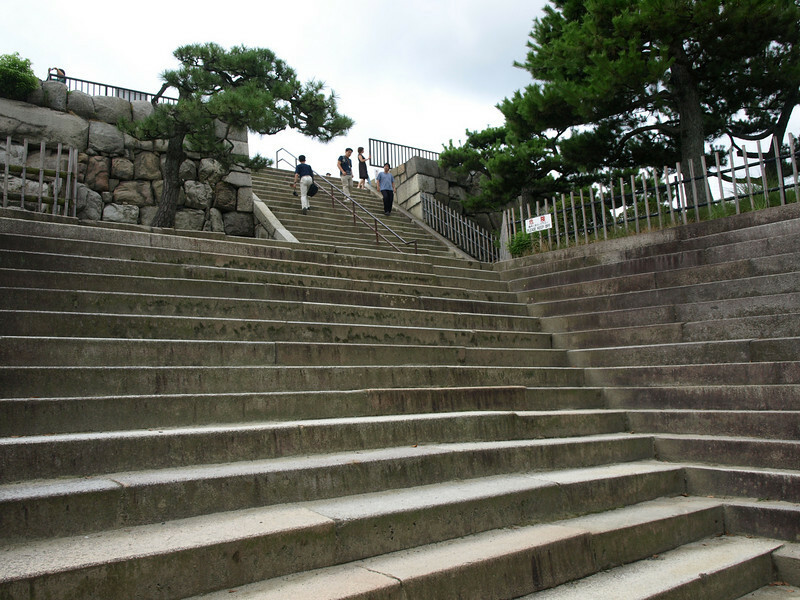 This stairway leads up to what is referred to as the Independent Raised Foundation located on the southwest corner of the inner moat. 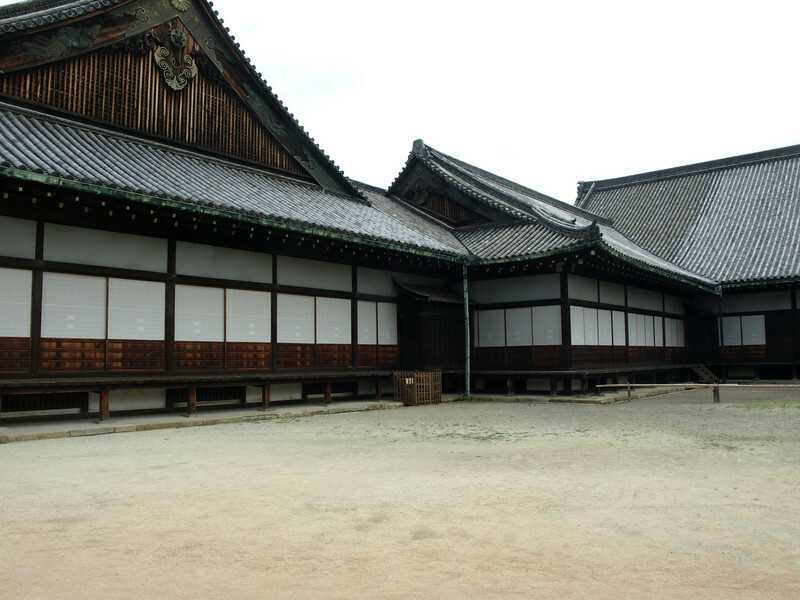 This foundation originally accommodated a five-story tower where the shogun could visit and enjoy the magnificent view of Kyoto. 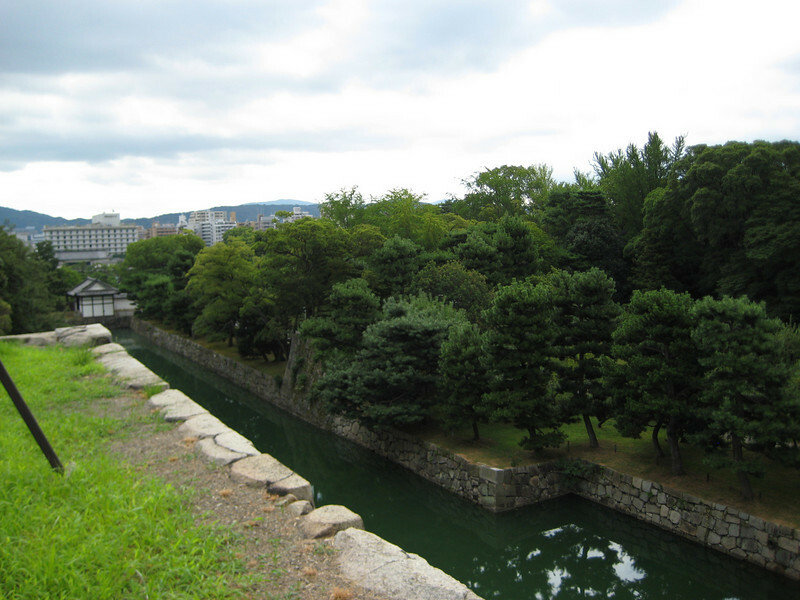 Atop the foundation, 50 feet (15 meters) above the water line, we take a look back at the Honmaru Palace complex. 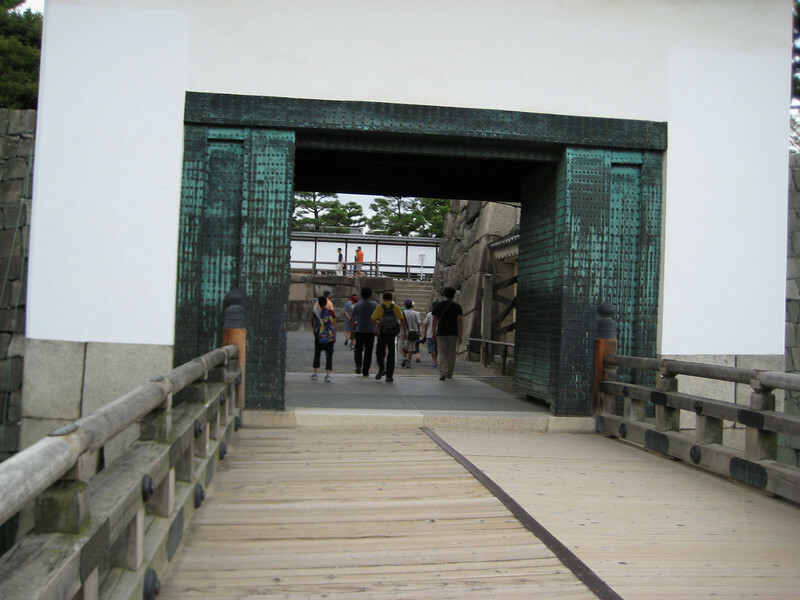 A video of the panorama taken from the four corners of the foundation promenade. 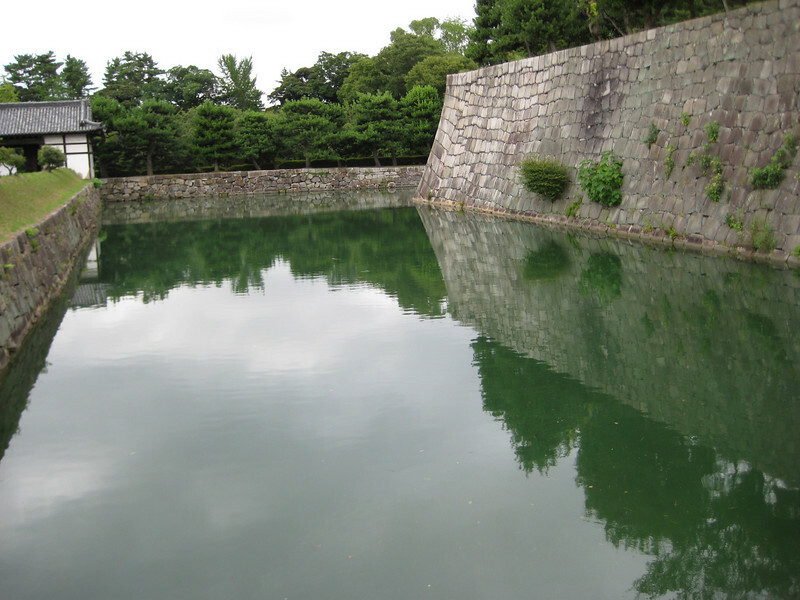 Looking alone the south moat, towards the front of the complex. 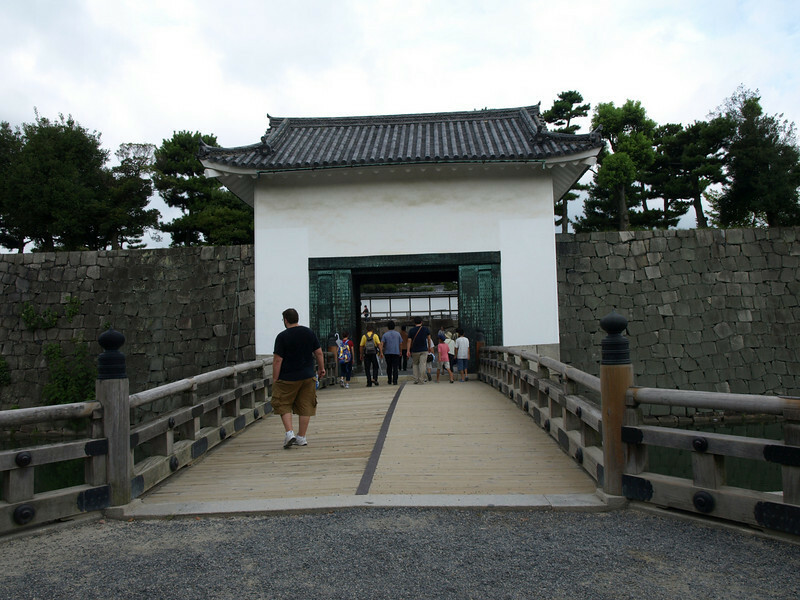 Still inside the inner moat, we wind our way towards the west (rear) portion of the complex where we will cross the bridge.